The cast of "Crazy Rich Asians" Ken Jeong, Jon M. Chu, Jimmy O. Yang, Sonoya Mizuno, Gemma Chan, Michelle Yeoh, Henry Golding, Awkwafina, Constance Wu, Chris Pang, Nico Santos, Ronny Chieng, and author Kevin Kawn arrive at Warner Bros. Pictures' "Crazy Rich Asians" Premiere at TCL Chinese Theatre IMAX on August 7, 2018 in Hollywood, California. For the Taiwanese-American who moved to the U.S. when he was 11, here was something he hasn't seen — a movie from a major Hollywood studio, with a cast of Asian-American and Asian actors. So when it comes out Wednesday, "I definitely will go and line up," the San Francisco resident said, and "make sure I go see it and bring all my friends." But Sangeetha Thanapal won't. Even though it's set in her native Singapore, when she saw the trailer, she said all she saw was a story centered on a specific subset of the already well-represented Chinese-Singaporeans who make up the majority of that country's population, and no real reference to the minority communities like the Indian-Singaporean one her family hails from. "This movie is going global," said Thanapal, currently living in Melbourne, Australia, "and the idea of Singapore is that we don't exist in it." Based on the best-selling first book in the trilogy by Kevin Kwan, "Crazy Rich Asians" is making it clear that "representation" can look very different depending on where you're standing. The premise is a fish-out-of-water story revolving around Rachel Chu, a middle-class Chinese-American woman who goes with her Chinese-Singaporean boyfriend Nick Young to his best friend's wedding in Singapore and finds out he and his family are, well, crazy rich. She has to deal with all that entails, including his disapproving mom. Helmed by director Jon M. Chu and with an international cast including Asian-American actresses Constance Wu and Awkwafina, British-Malaysian newcomer Henry Golding, and longtime Malaysian star Michelle Yeoh, the Warner Bros. film has spurred excitement among Asian-Americans thrilled to see actors who look like them in all the leading roles of a major Hollywood studio film for the first time since 1993's "The Joy Luck Club." "When you grow up as not being the dominant culture in America, we've had to grow up learning and training ourselves to see ourselves in characters and images and people that look very different from us, mostly white people," said actor and comedian Jenny Yang. But someone like the character of Rachel "is kind of like me ... it's just kind of nice to let your hair down and say, 'Wow, I can actually see someone where I don't need to flex this muscle of closing the gap between me and the person.'" 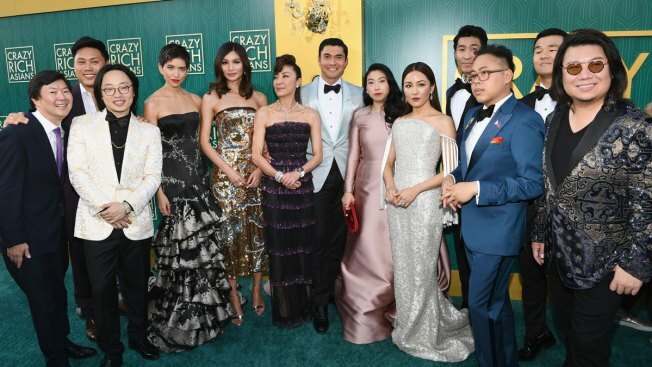 The stars of the movie themselves have been clear about how groundbreaking they feel the movie is and urged movie-goers to support it, with Wu writing on social media, "I hope Asian-American kids watch CRA and realize that they can be the heroes of their own stories." Just because something is representative in one context doesn't mean it's representative for others, say Thanapal and others who have critiques of the world the movie showcases and have pushed back against the idea that it's something they need to support so that studios see this kind of casting as economically viable. "Everyone else is told you have to care, even though we are not represented, we can't see ourselves," said Thanapal, an activist against racism facing Singapore's Indian, Malay and other minority communities. "You set a movie in Singapore and the only people in it are Chinese and you consider that representation? That is the problem — it's because you don't understand the dynamics," she said. "When people say that is the world of Singapore, they're saying that minorities don't exist." "Yes, it is a win for representation. In America," she said. "The lack of ethnic minorities, who do make up a significant part of the population, is just the same kind of Chinese-majority dominance that we would see in any other media in Singapore." Those involved with the movie have said that it's only a piece of the whole. Wu wrote, "For those who don't feel seen, I hope there is a story you find soon that does represent you. We're not all the same, but we all have a story."